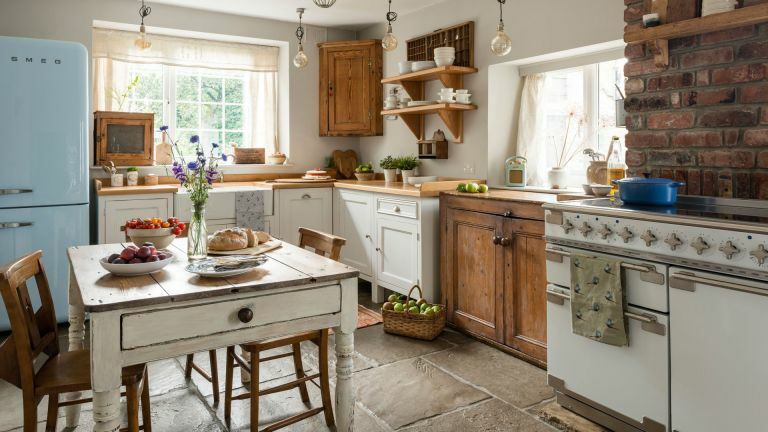 If you're designing a kitchen or, more specifically, if you're designing a kitchen for a period home, it's worth considering an English solution. Wherever you live, you’ll find British cabinetmakers and companies offering a wide range of services and designs, locally and nationwide, which is where ours tips for choosing an English kitchen come in. From calculating the cost of an English kitchen to choosing a style that suits your home, use our expert guide to ensure you've thought of everything when sourcing an English kitchen. Looking for more tips? Our ultimate guide to planning, designing and furnishing your kitchen covers everything you need to know before taking on a project. Our guide to how to design a kitchen is a handy read, too. Should you buy a bespoke English kitchen? While buying bespoke is naturally the most expensive option, you can expect impressive levels of service throughout all stages of the project. Opting for a company that offers a range of units customised to your requirements can help keep down costs, while off-the-peg solutions can be a budget-friendly option, although you will need to choose from the cabinetry ranges and finishes provided. Fitted, made-to-measure cabinetry, designed to accommodate structural anomalies or architectural features will, inevitably, make the most of all available space. Meanwhile, freestanding kitchen furniture – the only option available until the 1930s – is regarded by many as more in keeping with the traditional home. Our guide to how to design a freestanding kitchen is a must-read if this appeals to you. Alternatively, for the best of both worlds, you may prefer a combination of the two, or consider purchasing freestanding items that can be pushed together to form continuous runs, when required. What style of English kitchens are available? When it comes to choosing an English kitchen, there are more options available than you might imagine. While traditional Georgian, Edwardian and Victorian homes may best suit a property from the same period, Shaker styles are equally fitting in a kitchen with a more contemporary style. Cabinetry fashioned from English woodland timber makes for a high quality, bespoke finish and can be painted in a range of colours for a homely, country cottage feel. When it comes to sourcing a bespoke, woodland timber kitchen, we'd recommend considering Middleton Bespoke. Carpentry and woodworking has been the family trade for many generations and is designed and custom-created in a workshop in Sussex. Prices start from around £20,000. Intricate raised and fielded panelled doors tend to be the domain of the Georgian or larger Victorian kitchen, with double panels, pilasters and cornices also offering grand styling. British Standard offers early Georgian timber designs in handcrafted cupboards, worktops and up-stands, with prices starting from £400 per unit or £7,000 for a kitchen. Our guide to creating Georgian and Victorian style kitchens is a handy read if this style appeals to you. If you're looking for a specific design or are trying to fit a kitchen in an awkward space, you might consider opting for a bespoke kitchen. The handmade cabinetry from Humphrey Munson combines classic designs and traditional joinery with modern technical innovation to create Georgian-inspired kitchen with all the perks of more modern options. Prices start from £35,000. In terms of style, a popular option for the period home – as well as in homes with a more contemporary home – is the simple Shaker kitchen as it can work in any setting and offers maximum versatility. Founded in 1989 by Philip deVries and Paul O’Leary, Loughborough-based Devol has built a reputation for classic English and Shaker kitchens, with prices starting from £8,000. Like the idea of a Shaker style kitchen? Use our guide to how to design a Shaker kitchen for expert advice and inspiration. Those wishing to introduce subtle contemporary styling to their period home might try a cabinetry solution that combines a more classic colour scheme and style with contemporary fixtures. Handcrafted in the Midlands, this kitchen from Mereway Kitchens features simple slab drawers and pared-back panelling for a sophisticated finish. Prices start from £10,000. Decided you like the idea of a modern kitchen, after all? Browse our ultra-modern kitchen design ideas for more inspiration. While a coloured finish may not instantly come to mind when you think of a traditional English kitchen, they can make a statement addition to a space with either a traditional or contemporary feel. Dark, inky shades are particularly popular at the moment, adding interest and atmosphere to a space. For a wide selection of modern and traditional designs to suit all budgets, take a look at Wren Kitchens. Made in North Lincolnshire and Yorkshire, prices start from £216 per 60cm base unit and £4,806 for kitchen shown. Like the idea of incorporating colour? Browse our colourful kitchen design ideas for more inspiration. Soft, pared-back panels sum up restrained Edwardian utility, while the key to successfully incorporating more contemporary designs lies in simply ensuring the overall look still remains in keeping with your property. Martin Moore specialises in bespoke quintessential English designs, all handcrafted in Yorkshire. This Classic kitchen, handpainted in Light Cream, epitomises turn-of-the-century styling, and is priced from £35,000. For a truly unique finish, or to create a space with more of an industrial feel, consider sourcing a salvage English kitchen. The brainchild of Dani Murru and Naomi Doran, Relic Interiors uses mainly recycled timber to create bespoke kitchens in its London studio. The timbers are ethically sourced and each design is unique. Prices start from around £1,800 for a 100cm base unit. We love the idea of pairing salvaged wood with on-trend dark interiors. You'll find more inspiration as to how this could look with our dark and dramatic kitchen design ideas.